Les over at A Tidewater Gardener annually posts his ten favorite photos from the year and he challenges readers to do the same. Since we have downsized and no longer maintain our acres of gardens, I’m not as serious about garden photography and rarely carry my heavy 35mm camera around my neck. But I do carry the world’s most popular camera in my pocket at all times. My iPhone! Not sure about these being my favorite photos but they jumped out at me while scrolling through hundreds! Since we spent most of the winter under a blanket of snow, I thought I should add at least one photo of the beauty it can bring. Taken on February 8, prints in the snow show where animals come to the stream banks. I love photos that tell a story and there’s one here. Peaceful demonstrators in Keene NH braved the elements for several hours for a cause on February 7. I can almost hear them talking amongst themselves…. maybe seeing whose turn it is to get some coffee.. among other more important things. Keene NH also provided another photo that I like. A rainy, gray day was brightened only by taillights at a stoplight on April 15. With family in Keene, we visit this area on a regular basis. We ventured out of the Granite State for this photo. Two lovely ladies in straw hats were admiring a seaside garden on the rocky shores of the Atlantic. We toured several Cape Neddick Maine gardens on this day during Garden Conservancy Days, June 22. Anyone who knows me knows I am interested in insects and have hundreds of photos and IDs The plump fellow below, the jumping spider, claimed the watering hose as his own at Rolling Green Nursery this summer. These are brave and scary looking spiders, but, oh so harmless. Whenever I moved in, he moved closer. They stalk prey and can pounce a few inches but I just give them a puff of air and they fall to the ground and scamper away. I really like these spiders because they have personality plus. July 12. The second photo below was a two-for-one. I was photographing the tachinid fly and didn’t see the second insect until I downloaded the photograph. The tachinid is a nectar eating fly as an adult, but one that lays eggs in insect hosts. 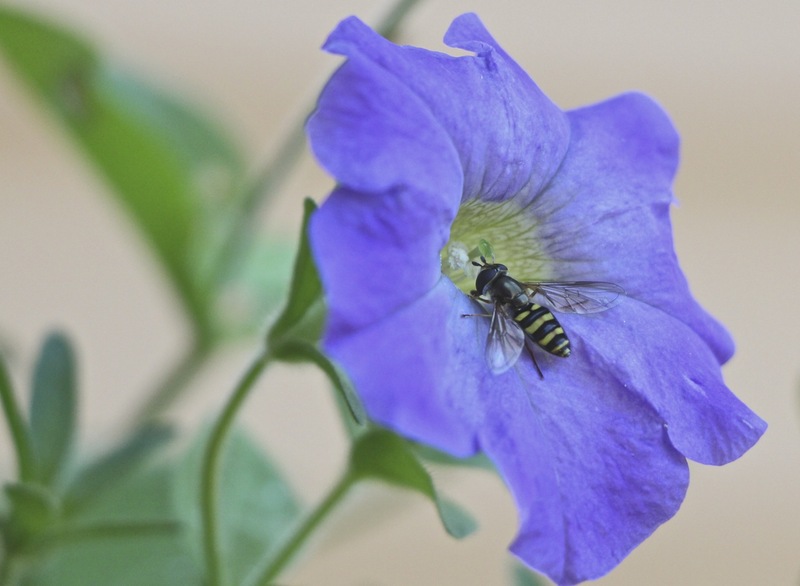 This time the lowly hover fly is the victim seen just below her body. I don’t like these flies very much as butterfly caterpillars are often victims. July 16. Rain drops on vegetation after an all night soaker is always interesting to me. The new growth on this spirea is an especially nice color. May 19. The sunflower below was a volunteer from our bird feeder. Several seeds that the birds overlooked germinated but only this one grew tall and straight and eventually fed the chickadees many ripe sunflower seeds. (Staring at the center long enough may hypnotize!) August 26. Finally, the highlight of 2014 was a vacation with the youngins to Bethel, Maine. Below are two photos from that hiking, swimming, boating trip in August. 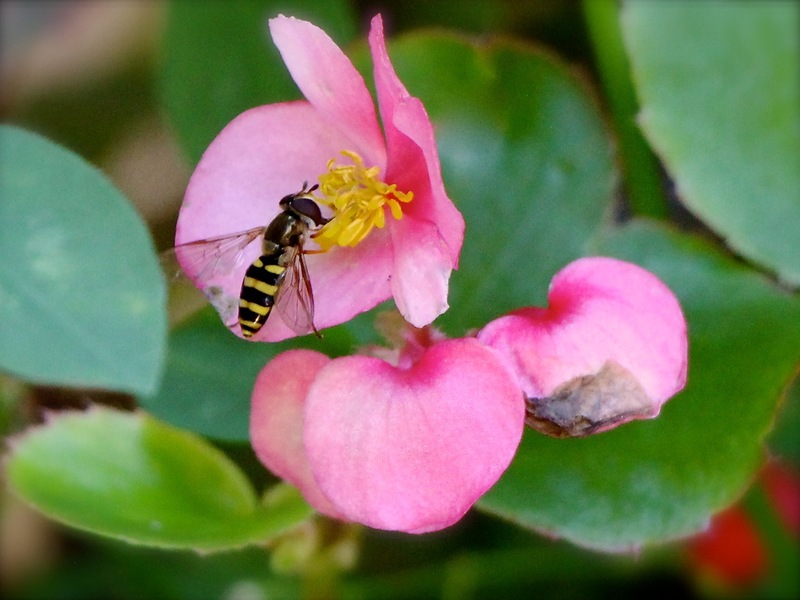 Click photos for closeups of Hoverflies in my garden.